ONE of the country’s most established building contractors has plans for major expansion in 2019 after doubling turnover. 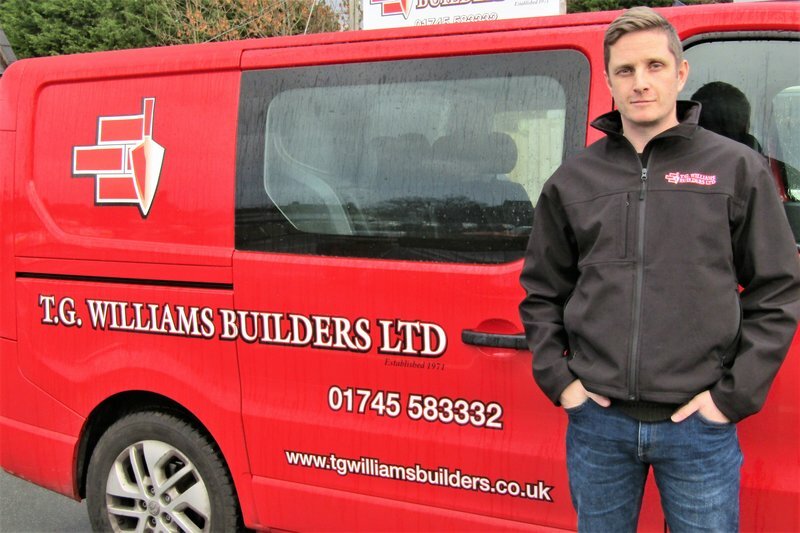 Founded by Trevor George Williams in 1971, TG Williams is a leading name in the construction industry, employing up to 30 staff in Denbighshire. Son Gary became managing director two years ago and has further strengthened the firm’s reputation in North Wales and beyond. Since graduating from the ION Leadership programme last summer, Gary and the St Asaph business have gone from strength to strength. TG Williams has reinvested profits back into the company, seen an increase in staff numbers and is winning new clients in the private and public sectors. Gary says taking part in the Bangor University-based course helped build his confidence and instil a more strategic approach for the management team. With plans to move to bigger premises and take on more workers in the future, the dad-of-two – who has been with the firm for 20 years – urges other directors and managers to sign up to the popular programme, which is aimed at organisations in north west Wales, with placements up to 70% subsidised by the European Social Fund via Welsh Government. “When I left school, I enrolled at college to become a quantity surveyor, but the lure of joining the family business and having some money in my pocket meant I never managed to complete my qualifications,” said Gary. “I started at the bottom and have worked my way up, learning all of the trades and working side by side with many of the people I now lead. “Together we have plans to protect the reputation my father has built up over the decades, but I also felt it would be good for me personally to learn more about management to take the company forward, which is why I signed up to ION. TG Williams is now looking to relocate and has already identified sites nearby, so the business can grow to meet demand. “We have around 30 employees on-site and in the office, but that doesn’t include the many sub-contractors we work with,” said Gary, who lives in St Asaph with wife Holly and daughters Georgia and Ruby. “We have the contracts and potential to take on far more, but there are not the skilled tradespeople out there – there is a massive shortfall. He added: “We were expanding fast and wanted to expand further, and the lessons I learnt as part of ION will enable me to manage our direction. “The programme has reinforced what we do and helped me to come up with new ideas, while delegating and encouraging input from everyone in the team. “We have grown quite rapidly, which is amazing, but we won’t do that at the expense of the high standards we provide and the caring side of the business, which we are known for because of the drive and determination of my dad. “We also know that the smaller, private residential projects and new-build developments are vital and the heartbeat of this business; they always have been and will continue to be important to us. Gwenllian Owen, Programme Manager of the ION Leadership programme, says the access to business information and advice via the course content and a series of top-level industry speakers has played a part in the growth of many firms across the region. She added: “It’s fantastic to hear about the success of TG Williams and Gary in particular. “He is one graduate who really immersed himself in the programme and came out of it a more confident and driven business leader.